Mark Rayner gives a concrete garden statue a complete makeover. You will need: An old concrete garden statue or ornament, paintbrushes, garden sprayer, stiff brush and some clean water, Resene Concrete primer, Resene Moss & Mould Killer, Resene Concrete Clear, Resene Lumbersider tinted to Resene Porsche and Resene Enamacryl Metallic tinted to Resene Bullion. 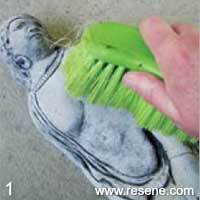 Remove any loose dirt and material from the concrete figurine or ornament with a stiff bristled brush, as shown. 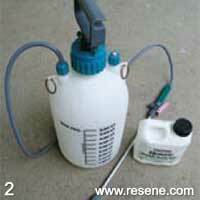 Mix one part of Resene Moss & Mould Killer to five parts of clean water and pour the solution into a garden sprayer. 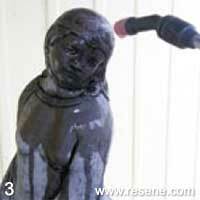 Spray the figurine with a generous amount of the solution. Leave for 48 hours. 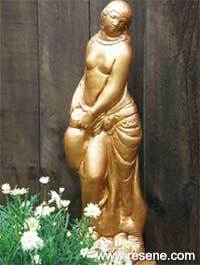 Wash the figurine thoroughly with clean water and then allow it to dry. 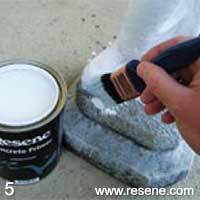 Apply one coat of Resene Concrete Primer to the figurine and allow it two hours to dry. 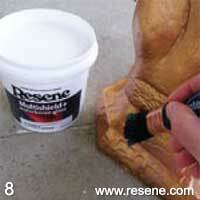 Apply one coat of Resene Porsche and allow two hours drying time. 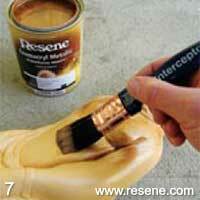 Apply two coats of Resene Bullion, allowing two hours for each coat to dry. 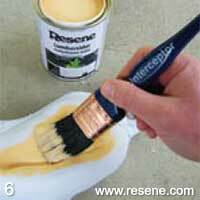 Apply one coat of Resene Concrete Clear, allowing two hours for it to dry.